Foreword: In the interest of providing some alternative views on national security we are inviting new views on our topics from a diverse group of individuals who can contribute to a healthy and creative debate on key international issues of our day. One such contribution is below. U.N. Secretary General Ban Ki-moon giving a speech at a press conference in Geneva. 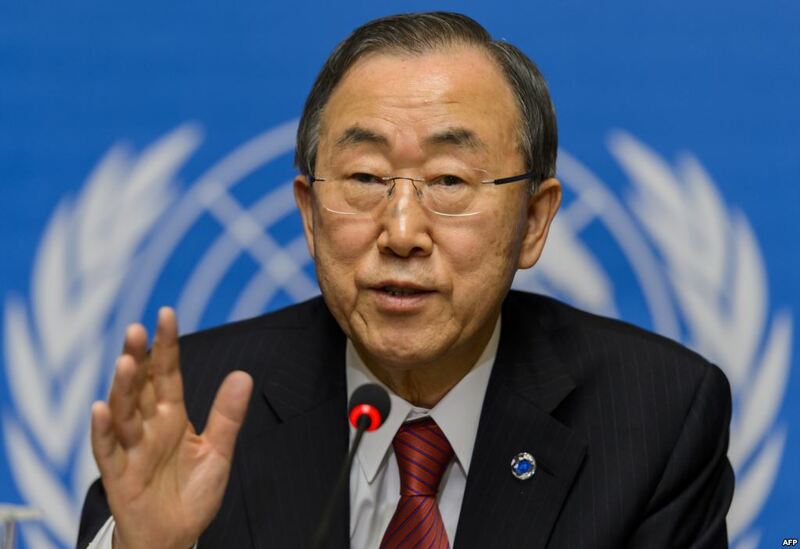 Recently, UN Secretary General Ban Ki-moon urged member States to recommit to “collective security” and human rights. He claimed the UN prevented another war but those who suffered from the lethal consequences of the Cold War or the current violence and loss of human rights as a result of an ongoing and predictably endless global war on terrorism might disagree. Peace, or the absence of war, particularly a nuclear war, was the original motivation for the creation of the UN. But it’s increasingly clear to those who deal with threats to individual and national security, and others concerned about human rights and the environment, that effectively protecting human security, national security and the environment will require more than just “peace”. What the vast majority of ‘we the people’ of the world really want is security without the loss of the freedom, and the prosperity that comes from maximizing both freedom and security. Threats like Ebola, Climate Change, violent extremism and WMD proliferation in a world where the rights of nations remain superior to the rights of ‘we the people’, will never see nations, people or economies free from threats and violations of the most fundamental of human rights — the right to life, liberty and the pursuit of happiness. Encouragingly, the UN Secretary General specifically stated that UN Member States needed to fortify a sense of unity on the meaning of the term ‘collective security’, which he stressed was the core purpose of the organization. He also noted that Nation States have been falling short of their responsibility to prevent conflict, something the UN Charter is very clear on. What he didn’t mention was the grand flaw of the UN’s original design of giving sovereign equality to all member states with absolutely no means of enforcing that equality, short of war, or sanctions — which can be more deadly than war. And, worse yet, the universal protection of human rights is only an afterthought. A grand gesture with absolutely no muscle other than words (in the Universal Declaration of Human Rights), accusations (frequent UN reports), powerless courts (ICC and ICJ) and noble promises (R2P). There should be no doubt that violations of human rights eventually weaken state sovereignty and national security. But not a single organization in the world is actively demanding or even offering solutions to resolve this grand flaw. If anyone is looking for such solutions, a new book lists them along with detailing rational means for achieving them. The book is titled “Transforming the United Nations System” written by Joseph E. Schwartzberg and endorsed by former UN Secretary General as “an essential reference work for all…concerned…”. Ban states “In today’s world, the less sovereignty is viewed as a wall or a shield, the better our prospects will be for protecting people and solving our shared problems…” But, in fact, it is the belief that national sovereignty is the key to protecting national security and human rights that is the grand flaw in the current UN system. Human rights abuses kill, maim, and displace people, divide communities, undermine economies and destroy cultural heritage. Ban called for “a conceptual shift” in international understanding of UN human rights action in order to transform the Security Council’s role in peace and security. Yet, no organization today boldly takes the stand in support of such needed transformation. Ban said “We must ask whether, for example, earlier efforts to address human rights violations and political grievances in Syria could have kept the situation from escalating so horrendously.” He went on to say “We must be willing to act before situations deteriorate. This is both a moral responsibility and critical for the maintenance of international peace and security. We cannot afford to be indifferent.” Anyone adding up just the economic costs of our indifference would have to agree. Regarding many other important issues of international concern, the UN’s 70th anniversary should serve as a chance to seriously reflect on nation states’ common enterprise and to take transformative actions like those detailed in Mr. Schwartzberg’s book. And high on any list should be the newest, laudable, affordable and achievable goals soon to be affirmed for sustainable development and climate change. But we must recognize that any hope of actually achieving these vital goals will require three fundamental tactics. The context of national security and protecting fundamental human freedoms in advocating for both of these. The world still awaits an organization (or movement of organizations) that will stand for and passionately advocate for any or all of these fundamental prerequisites to having the world work for everyone. The bad news is that time is not on our side. Those with the power to make such change appear to be emotionally detached from actual deaths, torture, diseases, disabilities, pain and other suffering of hundreds of millions of innocent men, women and children. Some would say there is a lack of political will to do what is humanly doable. I’m beginning to think it is a lack of empathy and courage. We know what needs to be done. We know it’s the moral thing to do. We know we cannot bare the economic cost of not doing it. Nearly 40 years ago I attended a presentation on climate change. The title of that talk was “Is there intelligent life on earth?” In hindsight, knowing of all ‘smart’ technologies we have at our finger tips and the massive “intelligence agencies” our government funds, I would have to answer “yes” to that question. If asked “is there wisdom in our application of that intelligence?” The answer would be as self-evident as our God given universal rights to life, liberty and the pursuit of happiness. There are many issues which Chuck has raised that are important when we look at the macro world landscape that we have created and what we would wish for in the future. But the harsh reality is that we must act in the present. Gaining peace, national and human security, and safeguarding the environment must be addressed effectively now or we may lose the opportunity to transform our global system in the future in a positive direction. The major actors remain the key nation states and admittedly, the still sadly too weak international organizations, plus a host of non-state actors like terrorists, global irresponsible corporations, the malevolent super rich, major criminal gangs, and international banks – who all have the power to determine the future of our world in one way or another. A global change in the existence of sovereign states would not change the pernicious behavior of malevolent actors nor stop conflict, abolish hate of “The Other,” or get rid of evil in the world. On the key issue of security “without the loss of freedom” for our world’s population, a “world” government would not likely work or be feasible under the conditions of conflict, existence and distribution of military might, particularism, and power today. Even in the relatively homogeneous European region we are seeing clearly the problem of institutional dysfunction, lack of strong loyalty towards the central authorities in Brussels, little or no direct taxation authority, and not yet full democracy. Most importantly there remains little empathy between citizens of difference countries as seen in the indifference of Germany and its citizens towards the plight of citizens of Greece. Least anyone mistake these concerns, I have long advocated for strengthening our international institutions to deal with our world’s main major global challenges. I also want us to establish better funding mechanisms for the UN and other IOs. I strongly believe that we need a new set of 21st century organizations and/or added new instruments and capabilities in existing ones to solve global problems including to prevent humanitarian catastrophes and, address global climate change and health risks, address nuclear-proliferation, save the oceans and polar regions, and work on other macro problem areas. But there must be room at the national, regional, and local level for decision making, and the workings of effective democracy, civic activities, and community citizen debate and voting. I share with Chuck his anguish over today’s plight of our globe and the protection of its people. We have indeed failed to act when we should and we have acted when we should not. We do need to create paths towards better global governance and some of his noted reforms are needed. Some 36 years ago I wrote in a book support for a global tax on financial transactions which had been proposed earlier without success. We have the difficulty of seeing the nexus of our problems. It is not just the sovereign state, it is as Pogo would say “us.” Evil acts against our humanity are not just states but terrorist groups, bigots, corporations, banks, superstition, and religious, ethnic and nationalistic extremism. World government would not abolish all the diverse and powerful forces at work in the world. The “rule of law” that chuck desires can’t be just a concept, it requires enforcement and that means sometimes force of arms. Also “peace” is a necessary, but not only requirement, for achieving global security and human rights. Finally, our world today needs a focused and hands on application of joint national actions to stop the butchery and global risks we are seeing around the world which should and must not be ignored. National and institutional reform to empower the international community to effectively address our shared challenges will require decades if not lamentably a century. We can’t wait for this transition to act, and given the power of nations and their created organizations, these are the only tools we have and we need make the best of them and of ourselves. This is the realistic path to “collective security” that Chuck and most of the world desires and needs.